The SEKEM Vocational Training Center (VTC) was founded in 1997 to provide young people from the surrounding areas of the SEKEM Farm with a profound and holistic crafting education. By linking to SEKEMs companies or agricultural activities, theoretical learning can be directly combined with practical experience. Today, students can choose between seven different branches of education. One of them is the metal mechanic training. In SEKEMs metal workshop 30 young men are currently learning in three classes. But, also young women start to become interested in the profession. Hence, regular internships are organized, for girls who come either from the SEKEM School or another branch of the VTC. Students and teachers of SEKEMs metal workshop standing behind the new machine. Recently, SEKEMs metal workshop benefited from a generous donation from Germany. The Waldorf School “Uhlandshöhe” in Stuttgart gave two high-quality machines for metal processing to SEKEM: A lathe and a milling machine. The German SEKEM Friends Association and the School from Stuttgart are cooperating for a long time. Thus, the SEKEM Friends were able to initiate the donation and also paid for the transportation costs and the construction in Egypt. Withal, they received support by the City of Stuttgart, which contributed not only financial wise but also by helping to find competent specialized staff from Germany for training sessions in SEKEMs VTC. Hence, Wilfried Ulrich, a former teacher of the school “Uhlandshöhe”, who had used the machines for many years in his lessons, traveled to SEKEM and helped with installing the complex machineries. 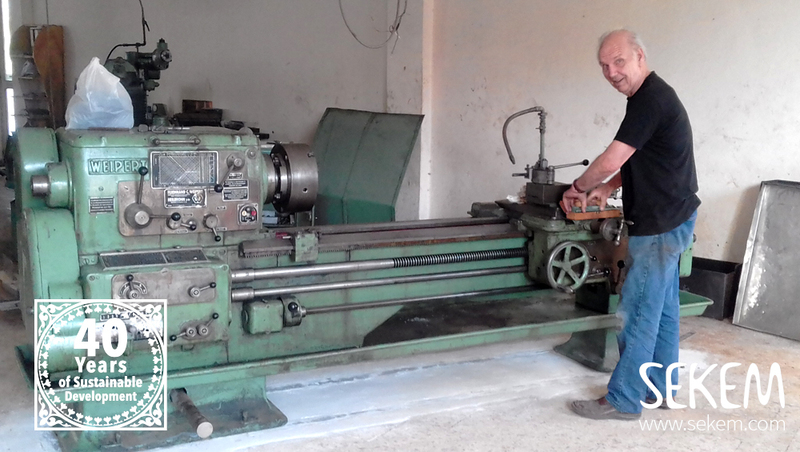 The German teacher Wilfried Ulrich helped with installing the new lathe. Together with Adel Sayyid, a former SEKEM student, Abdullah is leading the metal workshop. With the lathe, students are now able to process especially large items. “We produce agricultural equipment for SEKEM or repair broken parts from the machineries of the SEKEM companies,” says Abdullah. 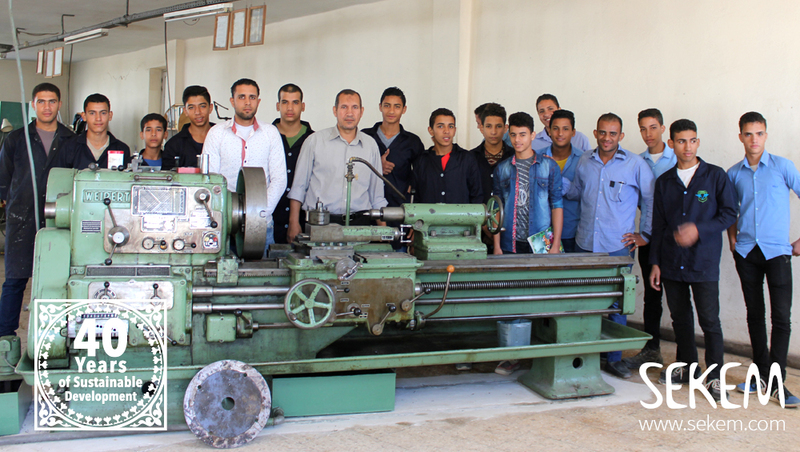 “Recently, we fixed for example a tea bag filling machine.” Through the connection to the different SEKEM companies, the students of the Vocational Training Center receive a dual education. They do not only learn theory and practice, but also produce something whose use becomes immediately visible – or something that the production depends on. 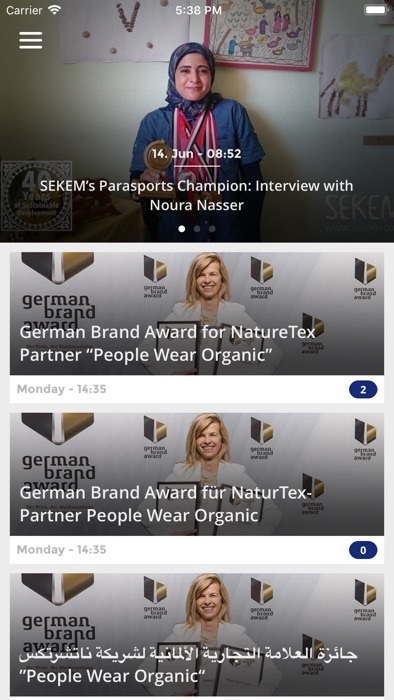 “This advanced knowledge that our students have after their graduation, makes them very popular on the job market,” says Gamal Sayyid, director of the SEKEM Development Foundation that also runs the Vocational Training Center. “And that is the case for the teachers too. They are often headhunted by other institutions, as they also learn a lot in SEKEM, among others through regular training courses with European specialists,” he reveals. Much smaller but as helpful as the lathe, is the milling machine, which was also donated by the German School. The technique is specialized to the processing of small items. But it is also used for both, the production and repair of equipment. “At the moment, our students are learning for instance how to cut holes to make a hammer,” explains Ahmed Abdullah. “With the new machines, we can strongly improve our training. Another benefit is that we are now able to do many repairs in-house, which we had to give to external service providers before,” the SEKEM teacher says. Student and Teacher working together at the new milling machine. In addition to the metalworking machines, two weaving looms were donated to SEKEMs company NatureTex for ​​cotton processing. The looms are used to weave colorful carpets from the remnants that are left over from the production of children’s clothing or doll making. The weaving of textiles usually takes place in phases. Since in the past, bottlenecks often occurred during these times, the two new weaving looms are very helpful for NatureTex.